I catered the prom Saturday night. 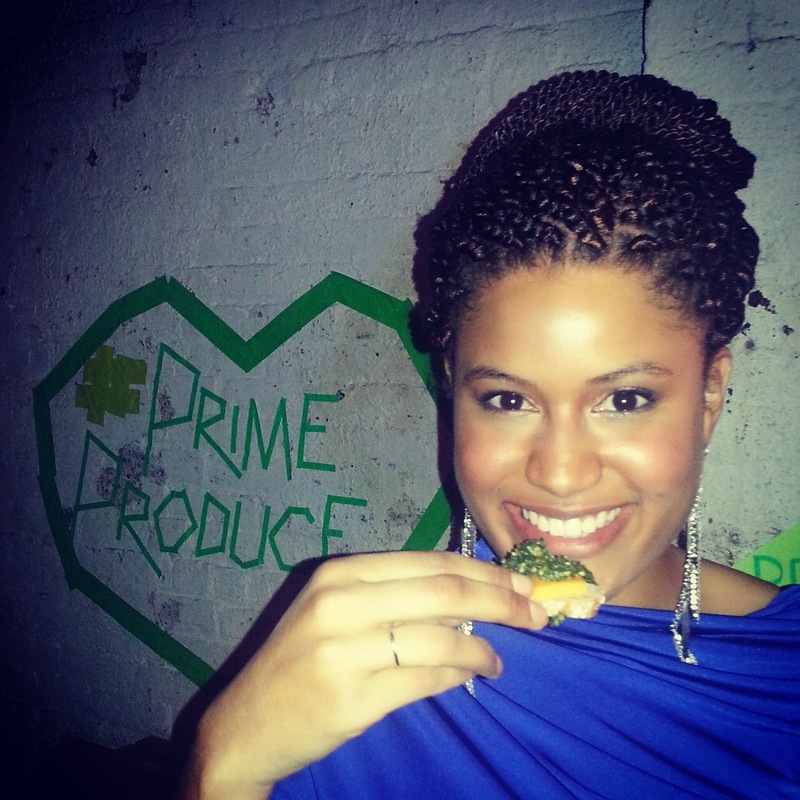 Every year Prime Produce, a volunteer collective that cultivates altruism by supporting other non-profits throws a fundraiser and friend-raiser for several organizations. They do a tremendous job in planning the venue, DJs, photographers, decorations, food and drinks. The participating organizations promote the event and keep the proceeds from their attendees. I’ve been marginally involved since introducing my friend’s organization, Emerging leaders in Technology and Engineering (ELiTE), to the Prom three years ago, but this year I wanted to be a bit more hands-on and introduce Runaway Apricot to the crowd. The mission was to prepare light snacks to counterbalance the open bar for a crowd of a few hundred people. I gave myself the additional task of preparing local, seasonal and healthy dishes that would make the crowd go “what is that I’m tasting?” And so I came up with two types of bruschetta: Collard Green and Pecan Pesto with Cheddar and a Roasted Fennel and White Bean Dip with Parmegiano-Reggiano. Both are pretty easy to make, are heavy enough to soak up some alcohol, can be made with late-fall ingredients and are super affordable. I made about 250 pieces for under $100! Souper Kitchen and a Calexico food cart were also on-site with more goodies for the crowd. Here’s the first recipe for those collard greens you can serve for a party instead of salt- or cholestorol-laden dip, or in your lunchbox for midday cravings without the calories. Before the cheese, it’s a vegan source of protein that will fill you up with many of the nutrients alcohol drains from your body. This recipe is also for the raw/paleo foodies out there – it’s only cooked for about 2 minutes to soften the vegetable and bring out its fantastic dark green color. Wash collard greens in a big bowl with a few changes of cold water until no grit remains. Fold each leave in half lengthwise and cut the center rib and stem away. When the water is boiling, add greens to the pot all at once. Use a spoon to submerge all of the greens in the water and cook for 2 minutes, until dark green and just tender. Pour greens into a colander and run under cold water to cool and stop the cooking process. Squeeze a bit of the moisture out then add the ball of greens to a clean dish towl. Twist and squeeze to remove most of the remaining moisture. Pulse greens in a food processor with pecans, vinegar, honey, and red pepper flakes until coarsely chopped. Stream olive oil in with the motor running until it becomes a coarse puree. Season with salt and pepper. Pesto can be made a day ahead and stored in a sealed container. Top each slice of baguette with a square of cheese and a spoonful of collard green pesto. Cut out the stem and center rib for each piece. In my mission to eliminate food waste, one day I’ll find a use for these stems! Blanching the greens softens them just a touch and brings out the color without pulling too many nutrients from the vegetable. I always shock with cold running water instead of an ice bath. Does the job with no scalded hands! After a a strong wring to get that water away from the greens, just add everything to the food processor. And there you have it. Hors d’oeuvres without all the oil. Drool worthy? « Thanksgiving is Coming – Make Your Table Sparkle! Mmmmmm ! I like it. I think I will try this sometime !